During the weekend, I baked mostly sweets for my sweety Kenzie boy as I wanted to explore my amateur baking skills and also introduce more varieties of food to him. He is such a picky eater and he only likes sweet foods (but not all things sweet because he dislikes ice cream though, hmmmm). 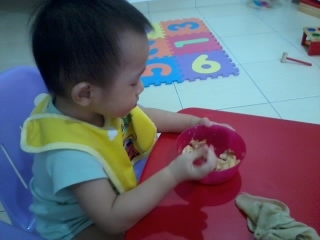 I cooked fish and tomato porridge for him on Saturday morning and I mixed 1 mashed boiled egg yolk before serving him. He totally hated it. Only had two mouths of porridge. Frustrated, I then quickly made honey cereal mixed with milk, and only two mouths of cereal went into his mouth. Giving up, I turned to liquid food. I boiled barley "fuchuk" tongsui the night before, and it was already ready in the morning, fed to him and he finished half a cup. I am really worried that he is not getting enough nutrients as his tummy is only loaded with sugary drinks and milk. Sigh. Anyway, for dinner, decided to try something different. 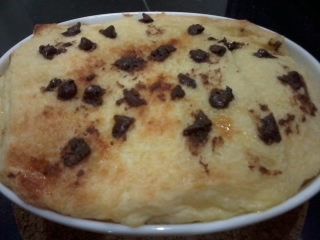 I baked bread and butter pudding topped with chocolate chips and he just ate a few mouths. That was it? Sigh. But at least something went into his tummy instead of just milk. I spreaded margarine on both sides of six pieces of bread (crust removed), arranged them in my baking bowl. The milk custard was made using 200 ml milk, 2 tbsp brown sugar and 1 egg. 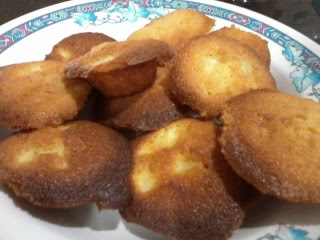 Baked them for 30 minutes. Yesterday for breakfast, Kenzie's menu was oats with a bit of condensed milk and french toast (dipped in egg whisked with sugar and then lightly fried with a bit of cooking oil). He ate the oats but hated the french toast. Maybe he did not like the texture of the oily bread. French toast is one of my favorite food and I still remembered when my mum made french toast, I jumped with joy and I could wallop the whole loaf of bread. Went to my mum's place and Kenzie had lunch there. Mum cooked pork chops with onions and lots of gravy. So Kenzie had some rice with gravy. Came home in the afternoon and I was in the mood to bake some mini apple butter cakes for a change instead of the usual banana or orange butter cake. Oh, coincidentally it was the Chinese Valentine's Day yesterday (Chap Goh Mei). Haha. So I was thinking to bake for my hubs, too. Anyway, same ingredients, the only difference was I used chopped apples and mixed into the batter instead of the usual mashed bananas or orange zest+juice. Simple ingredients with simple instructions: 1/4 bar butter, 1/2 cup self-rising flour, 1/2 cup sugar, 2 tbsp milk, 1 egg and wee bit of vanilla essence. Ooh, and about half an apple, cubed. Mix everything together with a whisk (I just used a spoon). Butter the baking mould and scoop the batter into the mould. This recipe could yield about 12 pieces of mini apple cakes. I did not bother marinating the apples in cinnamon powder and brown sugar as I do not have any cinnamon powder at home. I had to say the apples inside the cake tasted bland (with only some hint of apple taste), but overall it tasted very good and melted together with the cake. If the apples were omitted, it would make a very tasty butter cake. Hubs gave thumbs up for this cake. Maybe this coming weekend, I will attempt on pure butter cake since I have some good quality butter left in the fridge.